1. Heat milk in microwave for 2 minutes. 2. Combine sugar, salt, butter and milk. When lukewarm, add dissolved yeast and warm water. Add egg and mix well. 3. Whisk flour and cinnamon together then add currants (or dates). Stir into the yeast mixture. 6. Beat 1 egg; use it to brush the tops of each biscuit. 7. Bake at 400˚ for 18-20 mins or until dough is set and golden brown. Remove from oven and allow to cool for at least 10 minutes. 8. Blend frosting ingredients thoroughly and mark crosses on the buns with icing. Tip: Put frosting in a zip lock bag and cut a small hole in the corner to dispense. 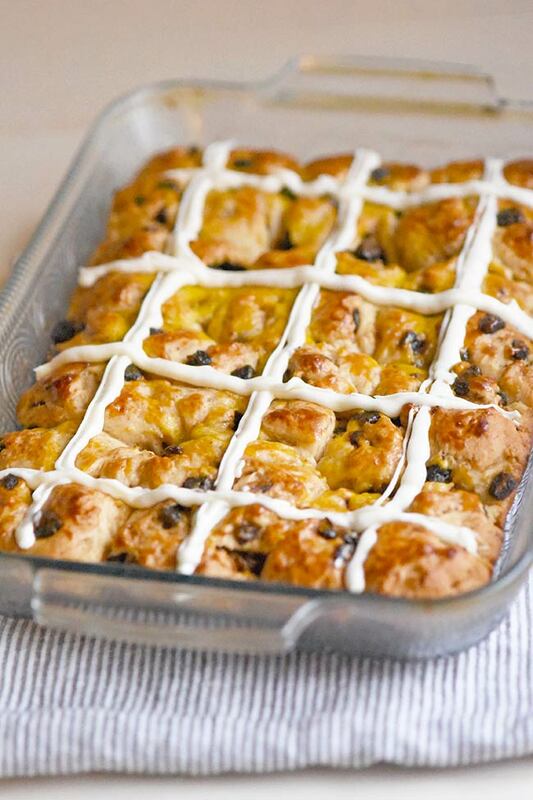 Looking for an easy hot cross buns recipe? This is the one for you. Easy enough to make on the first try. Hot cross buns seem old fashioned because they’ve been around for a long time! Hot cross buns have been around for a long time and are well known for a couple reasons. First, hot cross buns are a traditional treat served for Easter. Some articles will tell you that’s because dairy was once forbidden during lent and so on Easter, these sweet rolls were served to mark the end of lent. There are a number of different theories about why there’s a cross on top but most obviously would be the religious symbolism. I won’t get into that too much, you can feel free to google away if you’re interest in learning more about the history of hot cross buns! Then I’m sure Hot Cross Buns have a familiar ring, quite literally! You likely learned to play the song on your plastic recorder in music class but never really thought much about actual hot cross buns unless you grew up eating them. Recipe inspired from the recent past. Awhile ago I thrifted a Betty Crocker cookbook from the 70s and found a recipe for Hot Cross Buns. Curiosity got the best of me and I just had to try making the recipe. The buns took awhile to make due to the time you have to allow the dough to rise. However, the steps were pretty simple and even though these do require the use of yeast, it wasn’t complicated to activate. I was able to successfully make these on the first try, so I’m sure you can too. What if you can’t find currants? I couldn’t easily find currants so I ended up using dates. You can always order currants from Amazon though should you prefer to keep as close to the original recipe as possible. There are many, many recipes for hot cross buns. This hot cross buns recipe may have been an oldie but it’s still a goodie. Not all hot cross recipes are the same though. Many recipes claim that authentic hot cross buns are created using an additional flour mixture to create the cross. This recipe simply uses icing to create the cross. It’s much simpler and the icing complements the overall sweetness of these buns. Tips for moist hot cross buns. These buns are by nature, pretty dry. If you prefer a more moist bun, then you should soak the currants (or dates) for at least 20 minutes in order to re-hydrate them before adding them to the batter. You may also want to brush these with melted butter before icing them. Serve these hot cross buns for brunch. These are especially popular around Easter but these make a great addition to any brunch. Want even more brunch ideas? Browse all my brunch recipes. 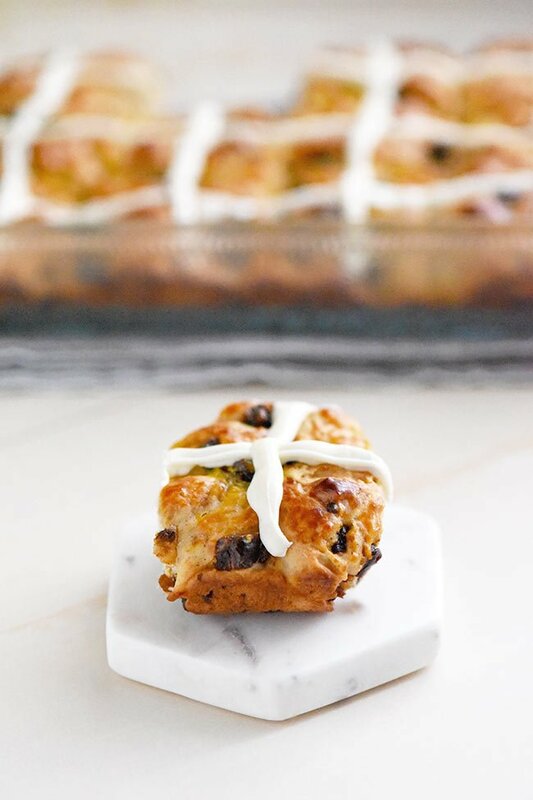 This easy hot cross buns recipe was featured on Hearth and Soul and South Your Mouth!